“Mom, I’m bored. I have nothing to do.” It was a constant complaint ringing in my ears, the standard whiny demand of a kid having a day unfit for the usual pleasures and curiosities. Under normal circumstances, I would have been able to satisfy even the pickiest youngster with a coloring book and crayons, popping a DVD in the player, or tossing down a pile of jigsaw pieces of an Alps village onto the coffee table. But these tempting diversions were not going to cut it this time, for the simple reason that I don’t have a kid. The tape whining to mother was all in the head, my head. Everyone has had those days, the adjustment period between life’s crash course of chores, worries, and responsibilities that lets loose the floodgates of adrenaline, and the easier cadence of predictable daily routines. This period can seem downright dull in comparison, no matter how sunny the day nor relieved you are to get off that roller coaster. If I were Pierre in War and Peace, I would assuage my ennui with contemplative Masonic metaphysics. If I wanted to find comfort in kindred spirits, I would compare notes with famous philosophers and the just plain famous. If I wanted to fill my head with megabytes of minutiae, I would loose myself in one of the many online labyrinths of puerile laughs and brain teasers. Any of these avenues would be just the thing on any other day, but on this particular day, I suspected there would be no jump start, except forcing myself into any activity just to get myself moving again. So I started in on the periodic ritual which I continually procrastinate against: the rearranging of all the boxes, bottles, jars and cans that chaotically cram against one another during episodes of cooking haste. My first task was emptying the cupboards onto the countertops to assess just what I had and how much. From there, I collected all errant pasta packages and returned them to their original shelf. Then I worked on the canned goods. When I was halfway through the clutter, I found two unopened tubs of candied lemon peel, fixings of last Christmas’ mincemeat pie. The expiration dates were perfectly sound through the next holiday season, yet I could hardly afford the space they took up. I was ready to fling them guiltily into the garbage bin when one of the labels caught my eye, advertising a recipe using the peel. I was no longer guilty and no longer bored. As I waited for the two fragrant loaves of lemon bread to be lifted from the oven, the world was exciting again, full of possibilities. I was giddy with options. Would I tuck into a good book, watch an old movie or go for a walk? I quickly pushed the remaining groceries back into the cupboards. The reorganization ritual would just have to keep. Tomorrow, next week, next month, even next year, was another day. 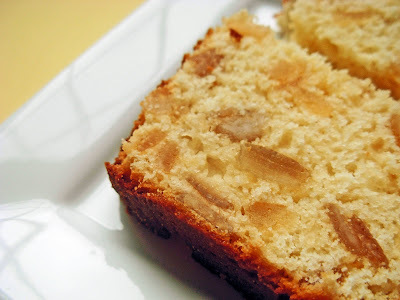 This post is being submitted to Becke of Columbus Foodie, host of Bread Baking Day # 2 - Bread with Fruit. Update: Round-up published August 25. Art reflects life, and probably no more so than in the immediate, visual splendors and pleasures of the silver screen. Beyond the dreary, predictable marketing schtick of product placement (how many cans of Coke do you really need foisted upon you? ), characters in film actually do eat and drink in their stories, sometimes as a plot point, symbolic gesture, philosophical statement, hedonism or just plain practicality. They (and we) are not gods and goddesses; we all need fuel, by Jove! So think about the films that you’ve enjoyed, perhaps even watched countless times. The movies don’t have to be about food or drink per se such as Babette’s Feast or Like Water for Chocolate (although they can be), but also think about flicks that lick at those food moments revealed with startling clarity, vague adumbration, or the light or dark reflections of the mood at hand. Entries can be dead lifts of dishes (mashed potatoes/Close Encounters of the Third Kind; rock cakes/Brief Encounter; even fast-food knock-offs from Super Size Me); or interpretations of food scenes that left an indelible mark (canned pineapple/Chunking Express; magic bread/Lord of the Rings; or chicken salad/Five Easy Pieces). Point is to make sure there is a connection between the recipe you are offering and the food or drink scene. If you need more of a feel for it, check out one of my previous posts. Posts from blogs written in native languages featuring films not commonly known to the English-speaking community are also welcome, but with the caveat that you must include in your email to me an English title translation and description of the movie and its food or drink scene*. In this way, I can present your entry in the best possible light, as well as have it at least marginally understood for the maximum number of readers’ enjoyment in the round-up. Non-bloggers are also welcome to submit entries. Please send me your copy, recipe and optional photo, and I will make sure you are included in the round-up. 5. 200 X 200 Photo: Optional (you can make dimensional adjustments if an exact square distorts your image). If you prefer, you can send a copyright-free or credited still from the film you are featuring. 6. * English title translation and description of film, food or drink scene and recipe for posts written in non-English languages, if applicable. Please email me at above address if you have any questions. Image use is optional. I look forward to your entries and THANK YOU in advance for participating. The round-up will be posted during the week of August 27 with entries billed in the order that they are received. I’ll make the popcorn! 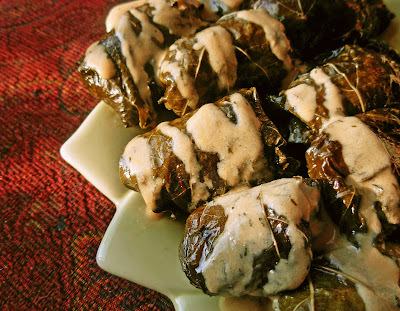 Stuffed Grape Leaves. Recipe after the meme. Trekking the spice routes East to West, Mayson generously lets us tag along through Indonesia, Malaysia, Singapore, Thailand, India & Nepal, Egypt, Morocco and Mexico. Loosely splayed pages, clearly parsed recipes, and informed, yet casual introductions to each region, make me want to renounce the boiled hot dog vendors stationed at every other New York City corner. The Red Sea Prawns, tails on and thickly coated with lime, cilantro, garlic and sea salt, are a succulent and tangy finger food. The ideal hand-holding companion for cooks like me who can’t get enough Indian cuisine yet are still slipping and sliding along the hairpin learning curves of tempered spices and ponderous varieties of pulses. The Gulabi Nimbu Pani (Rose Lemonade), is the most ethereal and refreshing of beverages, and a snap to pull together. 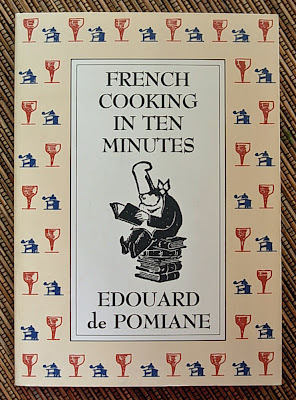 French by birth, Polish by blood, and a medical doctor by training, Pomiane was among the first to tinker with molecular gastronomics without taking himself too seriously. His writing is pragmatic, picaresque and perfect for demystifying the basic elements of French cuisine. Though he is gone some forty years, his presence can still be felt at our tables, where dishes of Alsatian Dumplings, Eggs Sur le Plat, and Sorrel Soup conjure convivial conversations and a leisured style of dining long dismantled and much mourned. The granddaddy of modern American cookery, Beard sets forth clear lessons in all the fundamental food preparation methods. Every recipe is a bonafide winner, whether a simple roasted chicken or Orange Bavarian Cream. No matter what level cook you are, these entries will not fail you. If you don't know how to do it, he will teach you - and how! With recipes spanning the first five years of Herb Companion Magazine, this unsentimental compilation is comprehensive in its inventive uses of the tried and true like rosemary (Bourbon Almonds) to the little known lovage (Loving Mary Cocktail). This slim classic volume of authentic, stick-to-your-ribs German-American farm fare was a family favorite, especially for the desserts like Shoo-Fly Pie and Anise Drops. It wasn’t until I was on my own that the nostalgia kicked in, but the book had long since disappeared. Wherever was I going to find another one? Why, Ebay, of course. If I had to choose one type of food to commit to for the rest of my life, it would be have to be those delightful mini-meals known as antipasti, tapas, amuse bouche and meze. Wright revels in 500 tiny taste sensations, each more enticing than the next. It’s so impossible to choose that it’s best to just close your eyes and divine your finger to a recipe on a page. What will it be? Burgundian Cheese Puffs, Fried Escarole Calzone or Stuffed Grape Leaves? The decision is made even more difficult by the sidebar snippets of provenance, anecdotes and charming cooking tips. Lydia of The Perfect Pantry - creator of Bookworm in the Pantry, a weekly post of reader recommendations for non-cookbook food writing. My book lists were featured in May and June. Yours can be, too. Shaun of Winter Skies, Kitchen Aglow - credited with introducing me to the marvelous authoress, Diana Henry. Tanna of My Kitchen in Half Cups - Second Helping - A woman with forty-four cookbooks on bread baking alone (! ), must have a whole heck of a lot more where they came from. 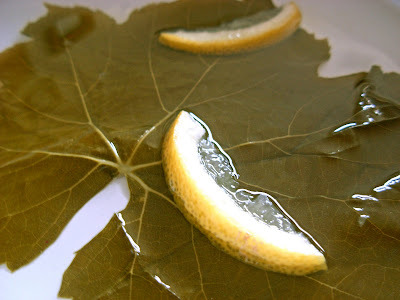 Very carefully remove rolled grape leaves from jar and transfer to a large bowl/pot of cold water with the lemon wedges. Gently unroll the leaves under the water and allow them to soak out the excess brine for at least 15 minutes. Floating helps the leaves to separate. In meantime, combine all other ingredients except the olive oil in a large bowl; set aside. Separate the grape leaves while they are still in the water. Expect some to be damaged; use these to line the bottom of a large skillet. Remove the intact leaves to a working surface, blotting well with paper towels. 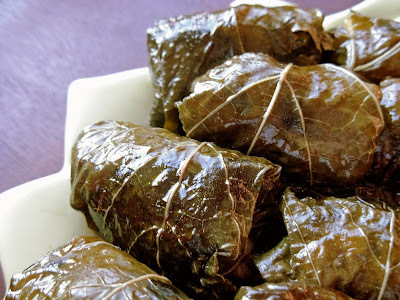 Starting with the largest leaves, nick off any thick lower stems, then roll each leaf into a bundle around approximately 1 tablespoon of rice filling. (Since the rice is already cooked and will not expand, you should roll tightly.) When you come to the smaller leaves, use less filling proportionally. Arrange the bundles seamed side down in the lined skillet until you run out of intact leaves or filling, fitting the bundles tightly or stacking them if you have to. Drizzle bundles with olive oil then add the water or stock to the skillet so that the liquid level is nearly covering the bundles. Add more liquid if you have to. Cover skillet and simmer on very low heat for approximately 1 hour or until a fork easily pierces the leaves. Check periodically and adjust liquid level as needed; do not allow bundles to dry out. Remove bundles to a platter to cool and cover them with the wet, damaged liner leaves. Meantime, prepare the avgolemono sauce. In a large bowl, beat the eggs with the dill, salt and pepper until light and frothy. Beat in the lemon juice, then slowly add hot stock in 1/8 cup increments, beating well after each addition; transfer to sauce pan. Continuously stir sauce with whisk over very low heat until sauce thickens and begins to steam. To prevent curdling, do not allow the sauce to boil. Remove from heat. (If there is any curdling, pour sauce through a strainer and add more dill.) Remove and discard the leaf cover from the bundles; pour sauce evenly over the bundles. Makes approximately 30. Amount varies based on size of leaves and how many are damaged. 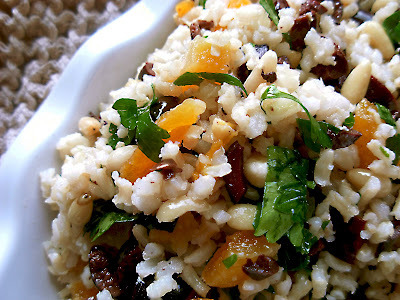 If you have any leftover filling, top with feta cheese and place under broiler until bubbling. This post is being submitted to The Chocolate Lady at In Mol Araan, hosting this week’s edition of Weekend Herb Blogging for Kalyn Denny of Kalyn’s Kitchen, the creator of this food blog event. De gustibus non est disputandum. (In matters of taste, there is no dispute.) The facts are plain: there are cilantro lovers and cilantro haters. The lovers (I count myself among them) are drawn to steaming, fragrant bowls of pho and scoopfuls of crushed green chutney, while the haters are picking out every last bit of chopped leaf from the pico de gallo and cursing its accidental purchase, mistaking it for its look-alike cousin, parsley. To put it mildly, neither camp “gets” the other, with the haters’ bloodlust for the aromatic plant taking sometimes mammoth, almost frightening proportions. It appears as though never the twain shall meet. Or can it? Is it possible that a cilantro hater can become a cilantro lover? In a manner of speaking, yes. There can be a modicum of reconciliation; all it takes is a little patience and a sweet tooth. Cilantro does not have to die to cease and desist producing its lurid leaves. 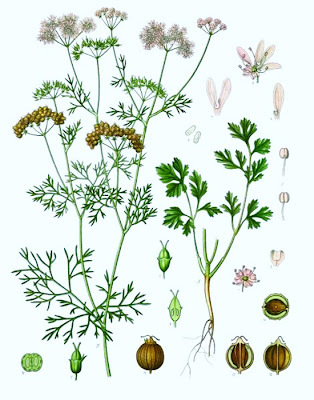 The plant, officially and botanically known as coriander, regardless of any of its entirely edible parts, has a very short cycle; in a matter of weeks “that stinking weed” will go to seed, morphing into a tender, tall plant with leaves as fine as pine needles and slim stems balancing petite white blossoms, very much like Queen Anne’s Lace. It is not even a shadow of its younger self, but an entirely new plant, unrecognizable from its former days of fetid offense. It is a romantic cloud bearing fruit, its seeds, not only to ensure a new crop next year, but to enchant many an Eastern, Indian and Middle-Eastern cook with one of the foundational flavors and fragrances of classic curries, sauces and spice mixtures. 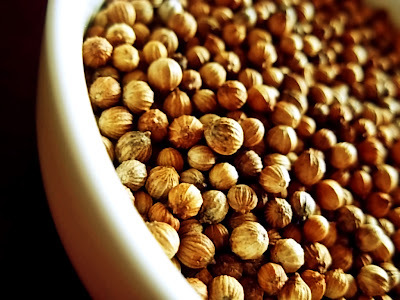 Despite one’s possible revulsion to the early leaf, it is quite likely that a cilantro hater has enjoyed coriander seed without even knowing it. These can be fighting words, I know. A peacekeeper is sometimes put in a position of great risk and winds up more beaten in the fray than the opponents themselves. The dispute will probably remain intact; all I can do is blur the line in the sand with a warm, sweet, perfumed syrup, then quickly back away behind the dunes. Madeleines adapted from the About.com recipe. Grease 20 (or 24, depending on the size) madeleine tins. In a large bowl, beat eggs and sugar until pale in color. Stir in the orange flower water, orange extract, orange peel and butter. Sift in the flour and gently fold in. Fill each mold to 3/4 with batter. 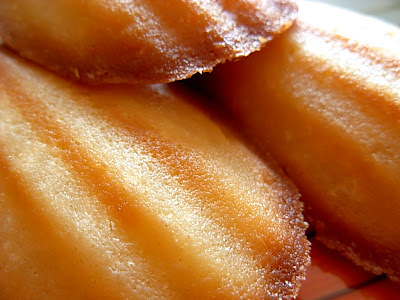 Bake for 15 minutes or until the madeleines are lightly browned and risen. Remove from pans and allow to cool slightly. Pour coriander syrup lightly over madeleines. Allow to fully cool before serving. Boil all ingredients then remove from heat. Allow to steep as it cools for 15 minutes. Strain seeds from syrup, discarding them. 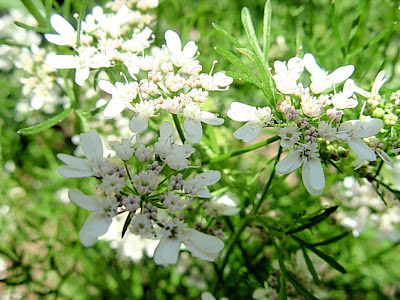 This post is being submitted to Chris of Mele Cotte, hosting this week's edition of Weekend Herb Blogging for Kalyn Denny of Kalyn's Kitchen, the creator of this event and the original cilantro lover. Mother knows best. She warned me several days ago that the cilantro was going to bolt. I didn't believe her; I had only transplanted the leggy, bedraggled, 8-inch seedlings a few weeks before. I didn't even think they would make it. They made it alright, but I didn’t make it to my mother’s garden in time. I was crushed. All, however, was not lost. I would still enjoy the cilantro’s highly-prized roots, which are never, ever left attached to the bunches for sale at my local markets. So I made my way through the thicket of peppers, eggplants and tomatoes, to where I’d planted the cilantro, to where I thought I’d planted the cilantro. The cilantro was not to be found. Every parsley, tarragon, oregano and basil plant was accounted for, but not the cilantro. I just stood there and stared at the haze of green bouncing in the breeze until my eyes hurt from squinting and the sun baked the bridge of my nose. “The cilantro’s gone,” I said to my mother as I picked my way out of the garden. Mother does know best, and so do most of you. Just because I didn’t know what I was looking at, the magical, floral transformation of what’s commonly called cilantro, didn’t mean that you didn’t. (I would have guessed anise.) 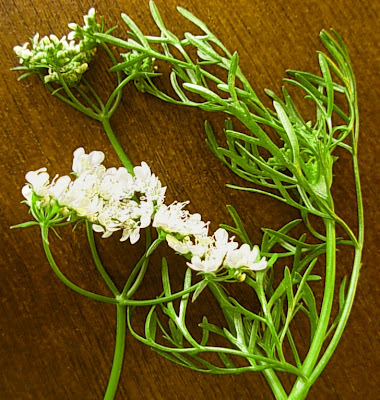 Non-bloggers, René (Anonymous/NWgardener) and Jennifer, and Sra of When My Soup Came Alive were the first three readers to correctly identify the photos as coriander. Winners, please contact me at confident_cook AT yahoo DOT com so I can arrange to send out your cookbooks. Many thanks to all who participated. It was a lot of fun. The next time I run a little contest like this, I will work harder to present a greater challenge for you. Mother will always know best, but now I know better. Recipe (being tested right now) coming up in next post. Please stay tuned! The fine print: Be among the first three readers* to correctly guess the culinary plant shown in Photos 1 & 2, and I will send you (all expenses paid) a brand-new copy of French Cooking in Ten Minutes by Pomiane. Bloggers and non-bloggers alike are welcome to play along regardless of where you live on the planet. Please leave your guess in a comment on this post. The answer, winners' names, and a recipe will be posted Saturday, July 7, around 6:00 PM (1800) New York time. Comments are considered up until posting. One guess per reader, please. Thanks for playing! Good luck to everyone! * To include readers in other time zones who will be later in seeing this post, I am offering up to three prizes rather than one. In order to ensure a level playing field, I will not be responding to anyone's guess, right or wrong, prior to the posting the answer. In the event that only one reader will correctly answer, only one prize will be awarded. In the event that no one correctly answers, I will select one name/winner at random, literally out of a hat. UPDATE: Non-bloggers, please include your first name when you post your answer comment. If you leave an anonymous comment, I will not be able to verify your identity in the event that you have answered correctly. Thanks.